Aiden Lassell Ripley was born in Wakefield, Massachusetts. He studied under the American Impressionists Frank Benson and Philip Leslie Hale at the Boston Museum School. Benson’s enthusiasm for wildlife and hunting subjects had a great influence on Ripley, and the two artists maintained a close association until Benson’s death in 1951. Ripley won the Museum School’s Paige Traveling Fellowship, which provided a year of European study from 1924 to 1925. On his return to Boston, Ripley settled in Lexington Massachusetts. He had his first one-man show at the Guild of Boston Artists and remained closely associated with the guild for the rest of his life. Ripley was an enthusiastic hunter, especially of game birds, and imbued himself in the sporting world he depicted in his art. 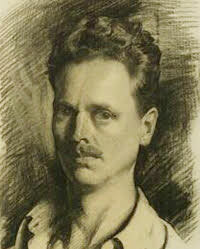 In addition to sporting subjects, Ripley worked as a portraitist, illustrator and muralist, and taught at the Harvard School of Architecture. He was the recipient of many awards and was a member of the National Academy of Design, the National Society of Mural Painters, the American Artists Professional League, the Audubon Artists, the American Watercolor Society and the Boston Watercolor Society.